If you want to start playing classical guitar, Fernando Sor’s music is one of the most effective ways to start. Often referred to as the Beethoven of Guitar, Fernando Sor wrote a plethora of deep and artful works. His Op. 60 is very interesting, as it was written close to the time of his death. 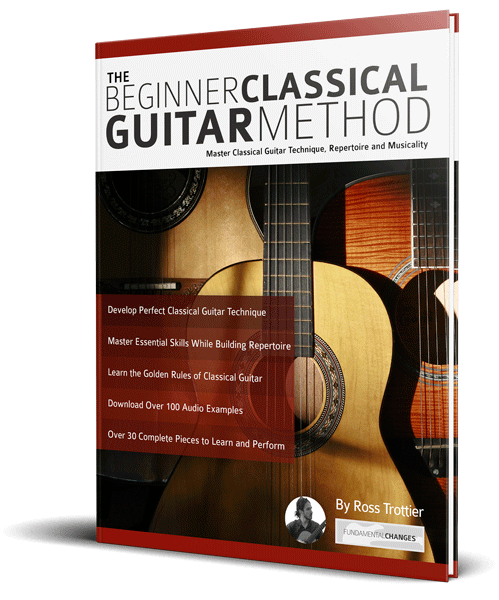 It was also written for beginners. The result was a collection of approachable, yet musically deep etudes. In this lesson, you will learn the first melody from this collection of exercises. The piece is in A/B form, which means there are two contrasting sections. Each of them are repeated. It opens in the key of C, and borrows from the key of G at the end of the first section. The second section starts on the dominant, giving the player plenty of tension to work into the audience. Each phrase in this melody is four measures wrong. Each section of consists of two phrases, acting in a call and answer fashion. This melody must be played with all the fingers on both hands, so be sure to pay close attention to the finger markings. By paying close attention to this detail early in the learning process, you will build coordination much faster. Subsequently, it is important to build good practice habits early on. Do not start playing classical guitar without being careful to build a disciplined practice routine. When approaching this piece for the first time, break the amount of material you work on up. It is best to master the first four measures alone, before moving on to the next four. When moving on to the next four, practice them without the first four. When both are mastered separately, play them one after another. Use this same approach for the second half of the piece as well.